The fruit of Aronia contains five times more polyphenol compounds of the grapes. 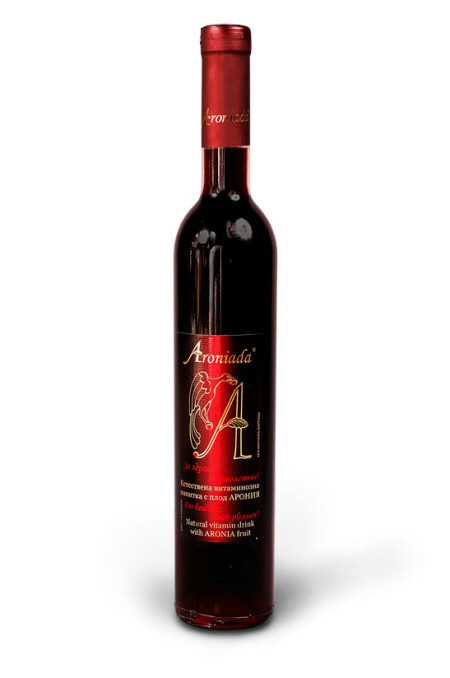 This makes wine with added fruit Aronia with more healing properties than the wine from grapes. 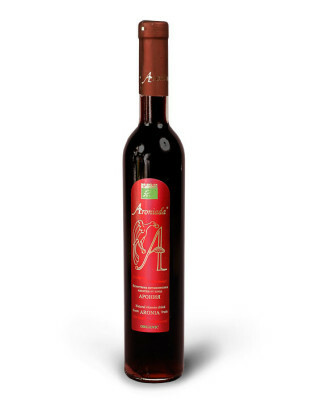 The offered product is a young red wine of high quality grapes and organically grown fruit chokeberry. In many ancient civilizations most prominent physicians compared the benefits of wine by the power of the Gods and it was important healing tool in their practice. In ancient China the wine was highly respected, because it improves digestion and mood and stimulate the internal vitality “Qi” of man. To the divine drink they added various herbs, fruits, resins – wine-based infusions have been used in any disturbance of the human health. The beneficial effects of red wine is mainly due to the high content of polyphenolic compounds (tannin content and pigments – bioflavonoids: anthocyanins, flavones, catechins) with the common name vitamin P. They have the strongest antioxidant and general strengthening effect on the whole organism compared with the other vitamins and no artificial substitute! Back in the 60s of the last century Russian scientific circles giving first place of the Aronia among polyvitaminous fruits with proven healing properties. The fruit of Aronia contains five times more polyphenol compounds of the grapes. 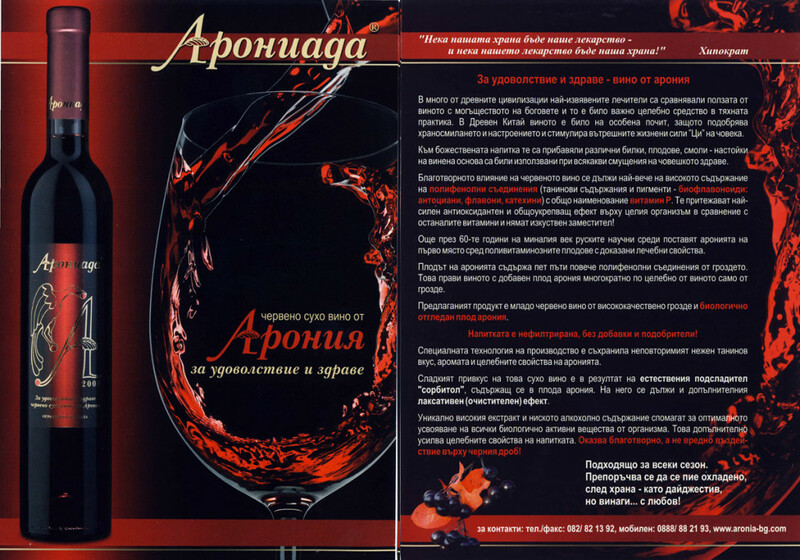 This makes wine with added fruit Aronia with more healing properties than the wine from grapes. 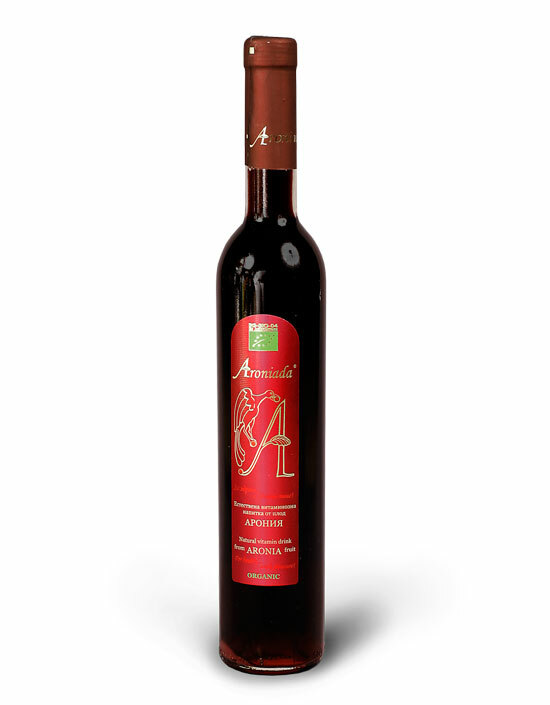 The offered product is a young red wine of high quality grapes and organically grown fruit chokeberry. The drink is unfiltered, without additives and enhancers! 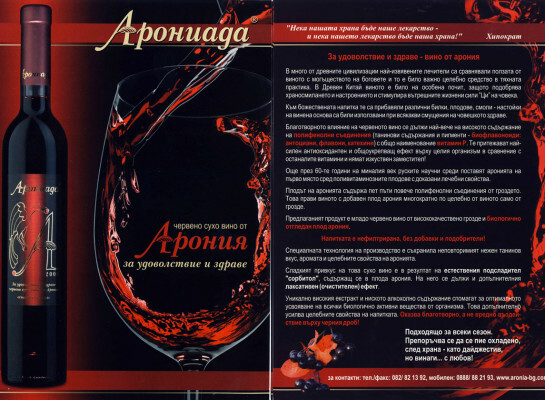 The special production technology has preserved the unique soft tannic taste, scent and healing properties of Aronia. The sweet taste of this dry wine is the result of a natural sweetener “sorbitol” contained in fruit chokeberry. It is due to the additional laxative (cathartic) effect. The unique high extract and low alcohol content contribute to the optimal utilization of all biologically active substances from the body. This further enhances the beneficial properties of the beverage. It has a beneficial rather than harmful effect on the liver! The benefit and enjoyment of this drink are equivalent! It is recommended to drink it with … .love!